Painted Metal Art Flamingo, Metal Wall Art, Tropical Home Decor, Outdoor Metal Art, Egret - Heron - Wall Decor - Switch Plate Covers - Haitian Metal Art > Painted Metal Flamingo Welcome Sign - Tropical Home Decor - 10" x 10"
Painted Metal Flamingo Welcome Sign - Tropical Home Decor - 10" x 10"
Pink flamingo, Steel drum metal art, Garden décor, Painted metal welcome sign. Garden art, Outdoor metal wall art, Tropical décor, Tropical art - Handcrafted beach house decor. A great way to welcome your guests. Handcrafted from recycled steel drum in Haiti. Hand painted. 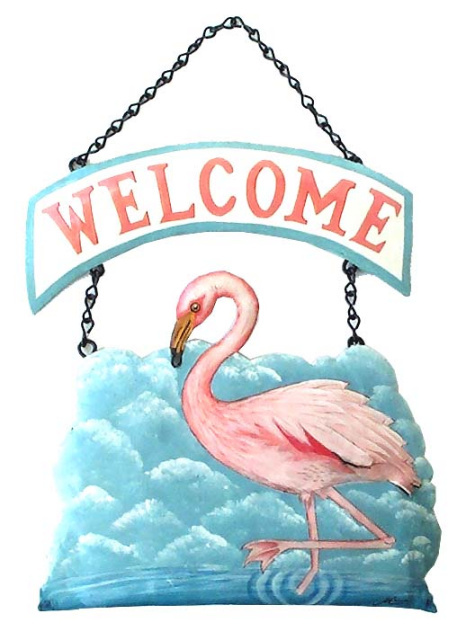 Painted metal flamingo welcome sign measures 10" x 10".